I can’t remember the last time I read a book involving time travel, which is surprising since I love history and historical fiction. 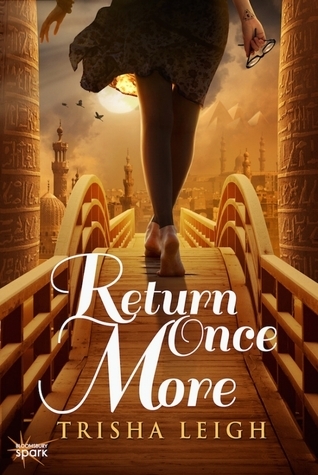 When I read Return Once More‘s synopsis, I thought this would be a good book to start my time travel reads, and it was. Return Once More begins with our main character, Kaia, witnessing Caesar’s death. We learn that earth was evacuated years ago and that mankind now lives on new planets. Technology has been developed for time travel, and the Historians, who Kaia is being trained by, are able to go back in time to observe what led to the fall of life on earth. One of my favorite parts of the book was the time travel aspect. Trisha Leigh did a great job of researching many different parts of history for this story. I enjoyed reading the historical scenes and liked learning more about some events and time periods. I had trouble wrapping my head around a couple parts of the time travel technology parts themselves, but that can be expected with such an idea as time traveling. In this future, another technology that has been created is the ability to find out who your True Companion (a.k.a. soulmate/one true love) is. This was interesting since your True could be from the past, present, or future. In Kaia’s case, she learns that her True is Caesar and Cleopatra’s son, Caesarion. Even though Kaia is only an apprentice, she finds her brother’s old cuff that will allow her to travel back in time to meet her True. She does this and she and Caesarion have an instant connection and instant love for one another. Even though they were supposed to have an instant connection, I still found it hard to believe that they could fall in love with each other so quickly. While all of this is going on, Kaia finds out that Oz, one of her classmates, has been also going back in time unsupervised and that he has been actually changing history. Digging deeper, Kaia releases that she and Oz have stumbled upon a conspiracy that will the affect the lives of everyone around them. This mystery was my favorite part. I definitely started flipping the pages faster while I got closer to the end. And, oh man, that ending. All I can say is that I hope that the sequel comes out soon! Overall, I really enjoyed reading Return Once More, and I look forward to reading a sequel hopefully soon. Her family is made up of farmers and/or almost rock stars from Iowa, people who are numerous, loud, full of love–the kind of people that make the world a better place. Trisha tries her best to honor them, and the lessons they’ve taught, through characters and stories–made up, of course, but true enough in their way. Trisha is the author of THE LAST YEAR series and the WHITMAN UNIVERSITY books. She’s represented by Kathleen Rushall at Marsal Lyon Literary Agency. If you enjoy New Adult books or a good contemporary romance, please check out her pen name, Lyla Payne! I second the first commenter – great review. The instant love observation stood out the most to me as I’ve been a bit overwhelmed with that trope in my reading pile lately, however it sounds like this story has a legitimate and fun reason for the quick pairings. I’m actually excited to see how Trisha works her magic! Thanks for the honest review and hosting the giveaway. Great review! I’m wary of insta-love, but the premise of the book sounds so interesting that I think I’ll have to check it out! Thanks! I hope you will like the book once you read it! WOAAAAHHHT? (Woah + What). WHAT is this MADNESS! Why haven’t I heard of his book yet? The whole entire concept sounds amazing my goodness. I’m adding it to my goodread shelf as we speak XD. I can’t even put in words my thoughts on this other than ASFHFDSFS DGF WTHW KSD ljga and asdfght. Thank you for the review, this book sounds great and you convinced me to read this :). So glad that you enjoyed it and that there is another awesome sounding time travel book out there :).